Caves are formed by the dissolution of limestone. 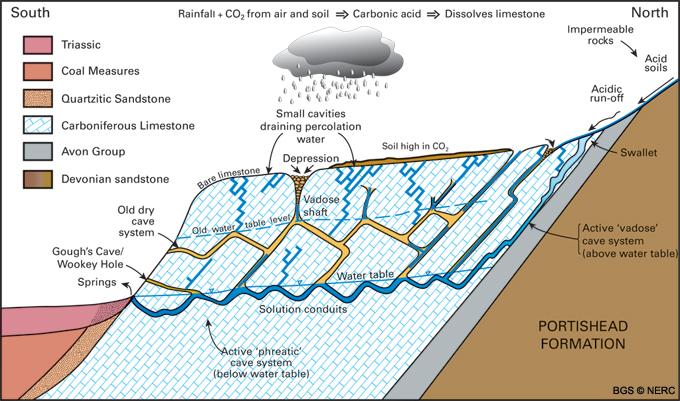 Rainwater picks up carbon dioxide from the air and as it percolates through the soil, which turns into a weak acid. This slowly dissolves out the limestone along the joints, bedding planes and fractures, some of which become enlarged enough to form caves. The largest caves form where water flows onto the limestone from the adjacent impermeable Portishead Formation (Old Red Sandstone), and Avon Group mudstones. The water sinks underground into holes known locally as 'swallets' or 'slockers'. The streams reappear at the base of the limestone outcrop at large springs, for example at Cheddar and Wookey Hole. Over time, the water finds new lower routes leaving some caves high and dry. Some of these have been dug out by cavers. The dipping Carboniferous limestones have produced a particular style of cave. A typical Mendip swallet cave is developed where a stream sinks underground at the contact between the Avon Group and the Carboniferous Limestone. 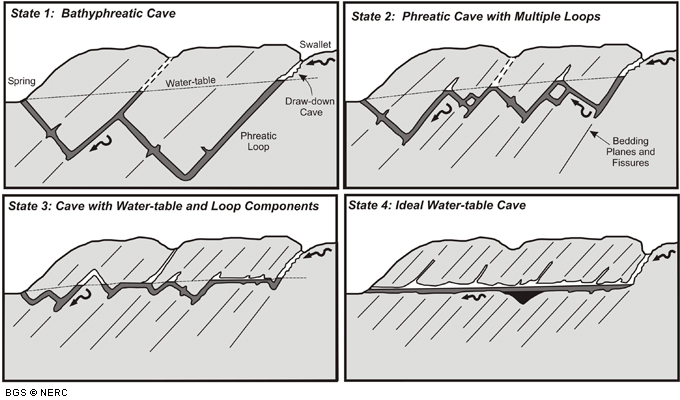 Initially the cave descends steeply, often down dip or along joints, via a series of small cascades or pitches. On reaching the water table the passage enters the phreatic, (sub water table) zone, marked by a water-filled section known as a sump. These phreatic passages display a characteristic looping profile as the water flows down a bedding plane, and then ascends up a joint or other fracture to gain higher bedding planes within the limestone en route to the resurgence. As time progresses, the cave will tend towards a more graded even profile. Erosion at the spring outlet may cause the stream to find a new lower course, leaving the former passage high and dry. In this way a whole series of abandoned former stream courses may lie above the active streamway. For example, Gough's Cave in Cheddar, is a former, abandoned, course of the River Yeo. Detailed studies of these passages can give clues about how the cave evolved over time and former water-table positions. These abandoned passages may become modified by breakdown and collapse, be partially infilled by sediment or stalagmite deposition, or even become reactivated or destroyed at a later date. The style of cave passage depends on the frequency of bedding planes, fissures and fractures within the rock. Massively bedded limestones will have bathyphreatic caves (State 1), while heavily fractured rock will generate water-table caves (State 4). On central Mendip, State 2 or 3 caves are most common. Styles of cave passages depending on the frequency of bedding planes, fissures and fractures within the rock. Massively bedded limestones will have bathyphreatic caves (State 1), while heavily fractured rock will generate water-table caves (State 4). On central Mendip, State 2 or 3 caves are most common. Stalactites and stalagmites form when rainwater falling directly on to the limestone percolates down through the rock, gradually becoming saturated with calcium carbonate as it dissolves the limestone through which it passes. On reaching an open (vadose) cave below, the calcium carbonate precipitates out (due to degassing of carbon dioxide) to form stalactites and stalagmites.